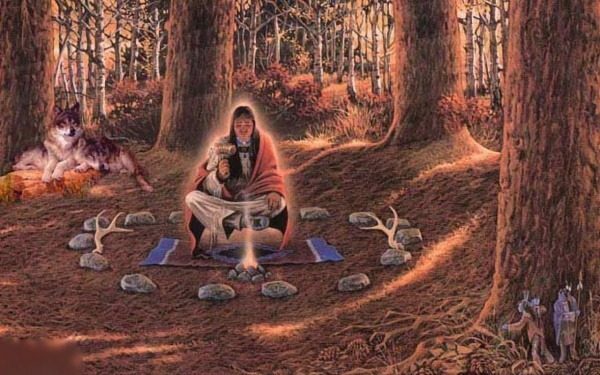 There was a race of spirit people named the Nunne hi, or immortals, whose home in the old Cherokee country was in the highlands. They had many town houses, or communal-type dwellings, especially in the bald mountains, the highest peaks of which no timber ever grew on. There were large town houses in Pilot Knob and under the old Nilwasi mound in North Carolina, and there was another one under Blood Mountain, at the head of the Nottely River in Georgia. The immortals were invisible except when they wanted to be seen, and then they looked and spoke just like the Cherokees. They were very fond of music and dancing, and hunters in the mountains would often hear their dance songs and drums beating in some distant town house. But when the hunters searched for the source, the sound would shift and they would hear it behind them or away in some other direction, so that they could never find the place where the dance was. The immortals were a friendly people too, and often brought lost Cherokees to their hidden town houses, where they cared for them until they were rested, and then guided them back to their homes. More than once, when the Cherokees were hard-pressed by the enemy, the Nunne hi warriors came to save them from defeat. They were invisible, naturally, but from the miraculous things that happened on the battlefield, the Cherokee warriors knew that the immortals were with them. The preferred home of the Yunwi Tsunsdi, also given as Nuh na yie, Nemehi, and Gemehi, or “Little People,” was a rock cave on the mountainside. They were little fellows, hardly reaching up to a man’s knee, but they were well shapped and handsome, with long hair falling almost to the ground. They were great wonder workers and were very fond of music, spending half of their time drumming and dancing. They were helpful and kindhearted, and often when people had been lost in the mountains, especially children who had strayed away from their parents, the Little People found them, took care of them, and brought them back to their homes. Sometimes the Little People’s drum was heard in lonely places in the mountains, but it was not safe or wise to search for it, because the Little People did not like to be distubed at home, and they would cast a spell over the stranger who did this, so that he was bewildered and lost his way. Even if he did at last get back to his home, he was ever after like a person dazed. Sometimes the Little People came near a house at night, and the people inside heard them talking. But the human beings were not to go out and look for them, else they would die. In the morning they would find the corn gathered or the field cleared as if a whole force of men had been at work. When a hunter found a useful object in the woods, such as a knife or a grinding stone, he was to say, “little People, I want to take this,” because it might belong to them, and if he did not ask their permission, they would throw stones at him as he went home. Once a hunter found tracks in the snow like those of little children. He wondered how they could have come there and followed them until they led him to a cave, which was full of Little People, young and old, men, women, and children. They assumed he was lost and brought him in and were kind to him. He was with them for some time, but when he left, they warned him that he must not tell others about them or he would die. He went back to the settlement, and his friends were all anxious to know where he had been. For a long time he refused to say, but finally he gave in to their pleadings and told the story, and in a few days he died. Belief in the immmortals and the Little People did not end with the Cherokees’ conversion to white ways. Two stories from the Eastern Cherokee Reservation show how those beliefs continued in the nineteenth century, and they continue today among the Eastern Cherokees and the traditional Cherokees of Oklahoma. During the smallpox outbreak among the Eastern Cherokees just after the Civil War, a sick man wandered off into the woods. His friends searched for him but could not find him. After several weeks he returned on his own and said that the Little People had found him and taken him to one of their caves, where they tended him until he was cured. In about 1895, two hunters from Raventown went behind the high falls near the head of Oconalufree River on the Eastern Cherokee reservation, and they found a cave with fresh footprints of the Little People all over the floor. Cherokee lore included other fairies. The Yunwi Amaiyine hi, or water dwellers, were prayed to by fishermen who needed help. Some friendly spirits lived in people’s houses, although no one could see them, and so long as they were there to protect the house, no witch dared come near to do mischief. Tsawa si and Tsaga si were the names of two small fairies who, although they were mischievious, often helped hunters. Tsawa si was a tiny fellow who was very handsome and had hair falling down to his feet. He lived in grassy patches on the hillsides and had great power over wild game. Deer hunters who prayed to him were able to slip up on deer without being seen. Tsaga si was helpful in other ways to hunters who prayed to him, but when someone tripped or fell it was known that Tsawa si caused it. There were several other fairies, all of whom were good-natured and tricky. Among these was De tsata, a boy who once ran away to the woods to avoid the punishment of being scratched. He tried after that to make himself invisible. He was a handsome little fellow and spent most of his time hunting birds with blowgun and bow and arrow. He had a great many children who were just like him in appearance and actions and had the same name. When a flock of birds flew up suddenly as if frightened, it was because De tsata was chasing them. He was also mischievious, and sometimes hid the arrow of a bird hunter who shot it off into a perfectly clear space but looked and looked without finding it. Then the hunter realized what was happening and said, “De tsata, you have my arrow, and if you don’t give it up I’ll scratch you,” and when he looked again he always found the lost arrow. There was one spirit who was not so friendly, and who prowled around at night with either an inner light or a lighted torch. The Cherokees called it Atsil dihye gi, “the Fire Carrier,” and they were afraid of it, because they knew little about it and thought it dangerous. They didn’t know what it looked like, because they were afraaid to stop when they heard it moving and saw the light. It might have been a witch instead of a spirit.